A science-fiction turn-based 4X strategy game and a debut of Amplitude, a studio created by former employees of EA and Ubisoft. The game takes place in the distant future, in a galaxy inhabited by 8 rivaling civilizations. 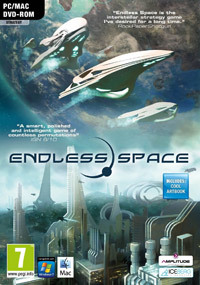 Endless Space for PC is a turn-based space 4X strategy. It is a debut game of on independent Paris-based team, Amplitude Studios. The company was created by experienced, former employees of such companies like Electronic Arts and Ubisoft. The action of the game takes place in distant future, in a galaxy inhabited by eight powerful civilizations. The player takes control of one of them and is tasked with dominating the others. What’s interesting, both the strategic aspect and battles are played in a turn-based system. Each battle is divided into five phases during which player’s activity is reduced to supporting his fleet or weakening the enemy fleet with special action cards. All sides perform their moves at the same time thanks to which multiplayer mode is much faster. Hundreds of space systems can be found in the game world and each of them has unique planets, resources and secrets. Thorough exploration of various moons can lead to finding artifacts of long dead races. The virtual universe is generated randomly always when a new game starts. However, it is possible to set properties of the maps such as size, density of planets, their size, number per system or age of the whole galaxy. Endless Space for PC offers spectacular space battles in which huge armadas can participate. However, war is not the only way to improve one’s position. Diplomacy, economy and winning a technology race are an effective way as well. The game also has diplomacy options. Races can create alliances, cease-fire treaties, trade resources, technologies, even whole planet systems. There are also heroes in the game. One can assign them to manage a system or lead a space fleet. Heroes are divided into five classes and each class has unique development tree. Graphics engine of the game allows immediate jumps from space duels to the strategic view where the space empire is managed. The developers created an advanced ship modification system which allows selecting drive, armor and systems of each unit. Game score 8.79 / 10 calculated out of 502 players' votes. Expectations before the premiere: 9.3 / 10 calculated out of 43 players' votes. Guide to the Endless Space contains a description of all crucial elements of the game and explained in details how they work.